If you are an experienced judoka (novice to advanced) you may visit and/or join at any time. If you are new to judo, please visit a Monday, Wednesday or Friday night class to discuss our program. First time visitors who do not own a uniform, should wear/bring a t-shirt and sweatpants; we have some club jackets and belts that may be borrowed for a trial class. PLEASE arrive at least 15 minutes before class starts in order to complete a waiver and get dressed for class. Children may start practicing judo when they can follow the coaches’ directions and not disrupt the class. That’s usually four to six years old. 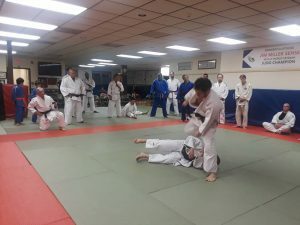 VISITING JUDOKA – We welcome Judokas from other dojos, kindly email if you expect to visit us to confirm your planned attendance; Visitors must have a current Judo card (USJF/USJA/USAJudo) and yes, we do have a mat fee for Adult Judokas who are visiting. Juniors (17 and under) never pay a mat fee, but must have a current card. Students starting out may wear sweatpants from home and can probably borrow one of the club’s jackets (judogi) for the first few classes. Women and girls should always wear a plain white teeshirt under their gi. Any jewelry must be removed or covered with athletic tape. Hair ties must not contain metal or hard plastic. We stock a small supply of judogis, various brands and sizes. Special-orders may be requested. Gear bags, shirts, patches, and miscellaneous items are also available for sale. A Nafuda Kake is displayed in the front of the dojo.